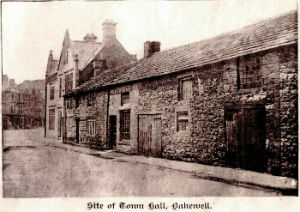 In the 1880s, Bakewell badly needed a new Town Hall, the old Market Hall on Bridge Street which had fulfilled the purpose no longer had the facilities required by the Local Board. The town’s masonic Lodge, the Dorothy Vernon Lodge, formed in 1887, were the main voice calling for a new Town Hall. They had been seeking a permanent meeting place. Many bodies have had their headquarters in the building: The Bakewell Urban District Council (which succeeded the Bakewell Local Board in 1897), the High Peak Institute, magistrates and county courts. Today it is managed by the Bakewell Town & Community Trust under a long lease from Bakewell Town Council whose offices are still in the building together with those of the Registrar of Births, Deaths and Marriages, an accountancy practice and a foot clinic. …at the heart of the town. The Duke of Rutland agreed to demolishing derelict premises in Anchor Square, and to contribute to the new building. The Architect was George Statham of Nottingham. The Duke of Rutland’s Arms are carved over the Gothic entrance. The original features (including the Assembly Room Theatre) remain as described in 1893. The cornerstone was laid with full masonic honours on 21 August 1889 and the building was officially opened by the Duke on 18 September 1890. The masonic lodge continues to meet in the Town Hall. The masonic lodge formed the Bakewell Town Hall Company which owned the building until 1945, when it was purchased by the Bakewell Urban District Council, the forerunner of Bakewell Town Council.